Put away your wallet, kick off your shoes, and settle in for castaway-style living with a luxurious twist. Robinson Crusoe never had it so good. There's not a lot of fussiness and finery at Galley Bay, on Antigua's wild and undeveloped west coast—and frankly, that's just the way folks like it. Guests of this all-inclusive resort tend to espouse 19th-century poet Robert Browning's words: "If you get simple beauty and nought else, you get about the best thing God invents." And simple beauty abounds at this toes-in-the-sand resort, where 40 secluded acres of tropical gardens nestle between a protected bird sanctuary lagoon and a three-quarter-mile private beach. Buildings with thatched roofs and wooden decks supported by rustic pilings meander along the beachfront and have a Swiss Family Robinson sort of look, promising lazy rum punch afternoons and barefoot, balmy-breezed evenings. 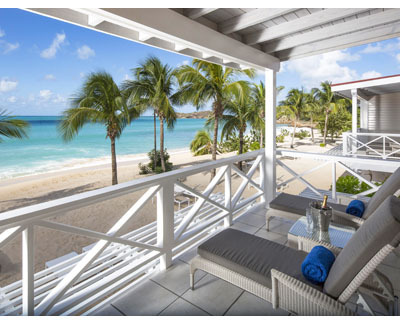 Everything about Galley Bay is convenient and walkable. A quick stroll takes you from clusters of rooms and suites—some located directly on the beach, others among poolside gardens with lagoon views and private splash pools—to any of its three restaurants and three bars that serve, among other things, afternoon tea, evening hors d'oeuvres, top-shelf beverages, and fresh Euro-Caribbean cuisine, all complimentary, of course. Plenty of activities are close at hand, too. Windsurfing, snorkeling, kayaking, and sailing Hobie-style catamarans are tranquil ways (think non-motorized peace and quiet) to enjoy an afternoon. Or stretch out by the freeform waterfall swimming pool with a rum punch and get into some serious attitude adjustment. At the end of the day, wander back to your cool and comfortable retreat—maybe one of the new luxury Premium Suites with rich mahogany furnishings, flat-screen TVs, iPod docking stations, and luscious corner soaking tubs.